All members are invited to First’s Annual Potluck THIS Sunday, Feb. 10, at 11:45am, where we will eat together and our kids will play together, all while the adults share our greatest faith stories from the past year. The full, more in-depth annual report will be available at the potluck, and can also be downloaded at 1stlu.org/report. The Sunshine Boys & Girls serve at First on the second Thursday of each month; the next meeting will be Thursday, Feb. 14, at 9am. The Sunshine Boys & Girls are an informal group that performs a variety of necessary tasks around the church; such as grounds clean-up, minor repairs, and other small jobs. Rolls and coffee are supplied to replenish your reserves! Dues are free! Contact Mike, our custodian, with any questions: mike@firstlu.org. On Saturday, Feb. 16 the OWLs, a group for those 55+, will fly to the Old School Variety Show at the Pump House in La Crosse, for a night of entertainment similar to Prairie Home Companion. Dinner will be downtown before the show; meet at church at 4:30pm. Cost: $18, dinner on your own. RSVP to Brian ASAP at owls@firstlu.org or 630.816.5917. Then, on Wednesday, Feb. 20, the OWLs will have their monthly potluck at noon in Fellowship Hall. The program will be a presentation by Skip Tempte about his around-the-world cruise. The middle school youth going on the mission trip to Duluth from July 21-26 will have their first planning meeting on Sunday, Feb. 17, at 11:45am, in the Mary room. A Faith Alive! U course presented by Gabe Hicks on Sunday, Feb. 17, 6pm. Join us for an evening of contemporary music. Gabe will sing the songs that have influenced him in spirit, love, life, struggle and happiness. Prayerfully offered from First Lutheran’s Yamaha grand, he will perform songs by MercyMe, Stephen Curtis Chapman, Jeremy Camp, Tenth Avenue North, and many others. Gabe will share his journey — both good times and bad — through music. Don’t miss it! Join us for worship on Ash Wednesday, March 6, with services at 11am and 6:15pm. Light lunch in narthex at 11:45am. 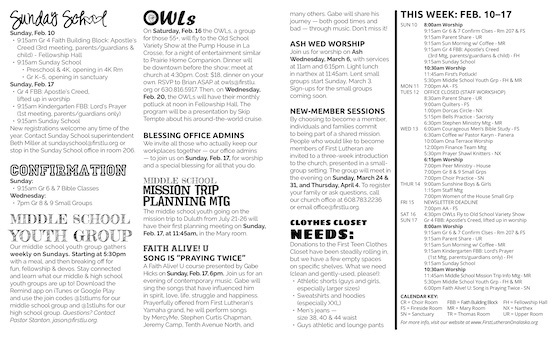 Lent small groups start Sunday, March 3. Sign-ups for the small groups coming soon. By choosing to become a member, individuals and families commit to being part of a shared mission. People who would like to become members of First Lutheran are invited to a three-week introduction to the church, presented in a small-group setting. The group will meet in the evening on Sunday, March 24 & 31, and Thursday, April 4. To register your family or ask questions, call our church office at 608.783.2236 or email office@firstlu.org. On Sunday, Feb 24 at 2pm, Good Shepherd Lutheran (4141 Mormon Coulee Rd, La Crosse) presents their annual concert with special guest speaker Mark Hirsch and special guest performances by: Karla Hughes, Gary Moss, the Lacrosse Central robed & upper treble choirs, Fifth Chamber and other local musicians. Cost: FREE; free-will offering will be gathered to benefit local flood relief. CONFIRMANDS: Attendance at this concert counts towards one of your yearly 3 confirmation electives. Spaghetti dinner to follow at 4:30pm. Cost: $8; purchase in advance by calling Bev at 608.792.3962. More info: 1stlu.org/caring. First Lutheran has, once again, offered to be a pick-up site for CSA boxes of produce from Small Family Farm in La Farge. Though deliveries won’t start until June, you can buy a share now. For info about products, prices and schedules, go to smallfamilycsa.com, or ask for a flier in the office.